Try to keep this in mind as you read the review: It's pronounced Constan-TINE, not Constan-TEEN. Whoops, I've already forgotten! The rebellious John Constantine studied the occult as an escape from his traumatic childhood. Now the world's greatest occult detective, Constantine thwarts threats from both heaven and hell between cigarette breaks. Sarcastic and cynical, he disdains anyone who underestimates him - be they mortal or immortal - and takes his greatest joy in outwitting powerful opponents. But through all his flaws, Constantine is still willing to sacrifice everything to protect the Earth. Back when Alan Moore created John Constantine, most mystics were older, upper-middle class people. He decided to buck that trend by creating a streetwise, blue-collar magician. 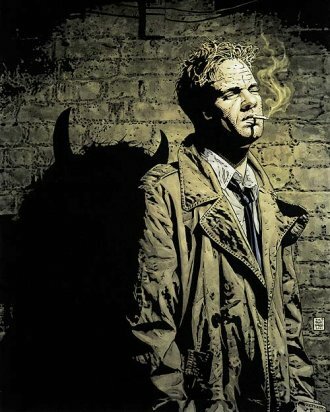 So in a way, John Constantine is an ancestor of Harry Dresden. They both even seem to have the same sort of crap luck when it comes to their personal lives. Hmm... has anyone ever seen the two of them in the same room at the same time? When he was first created, Constantine looked like Sting. Not Steve Borden, Gordon Sumner. Why? Because the artists on the book wanted to draw a character who looked like Sting, simple as that. He's gone his own way since then, so this figure will not allow you to start your own custom Police line-up. He's actually sculpted with the scar he got when his imaginary daughter knifed him in the face (John's life is crazy that way), but is otherwise fairly handsome. 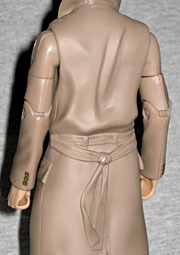 Since John Constantine's defining trait is that he wears a trenchcoat, it should come as no surprise to you that the figure is mostly the same mold as the Question: same coat, same shoes, same arms... and maybe new hands. At least, not the same hands that Question had, because he was wearing gloves and Constantine isn't. They could come from some other DCUC figure. He does have both his thumbs, though, so this figure clearly comes from sometime between issue #200 (where he got the scar) and issue #268 (where it got harder for him to hitchhike). One bit that's clearly new, however? The torso. John is a rumpled, disheveled character, and so he gets a very wrinkled shirt with a loose collar. He looks like he slept in his clothes, which is may well be what happened. Mattel didn't need to remold the chest this way, but it's true to the character, so we're glad they did. 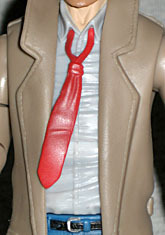 He also gets a new necktie, which is similarly loosened. The only complaint is that, since the coat is reused, it's fairly clean and crisp - for maximum accuracy, it should be just as gritty as the rest of him. It needs lot more wrinkles and a black wash. Unfortunately, between the new head, the new torso and the new tie, there was no money for a new coat. And also, no money for accessories. What accessories are we thinking of? Well, cigarettes, naturally. Like Jenny Sparks, John enjoys a good fag from time to time. Okay, all the time. He smokes about 30 a day. Silk Cuts, which are about the girliest cigarettes a Brit could get, so go figure. You can probably customize some smokes for him pretty easily, but you really shouldn't have to. We normally praise the Mike Thompson portraits on the back of the DC Signature Collection packaging, but not this time. Oh, it's still a very good painting - it's darker than most of them, fitting Constantine's tendency to stick to the shadowy parts of the world (both geographically and morally), and the jeans show light patches where the fabric is wearing out. So what's the problem? It's too... "together," for lack of a better word. Look at a random Hellblazer comic cover: he's a disheveled mess! This image is Constantine if he were attending the Queen's wedding. It's as clean as he's ever looked. This is one time when we wish Mattel would have broken with tradition and gotten Simon Bisley or Tim Bradstreet to do the box art - Constantine deserves something uglier than this. Or at least some stronger contrast, to make the shadows seem darker. The pose of his left hand makes it looks like there was originally a cigarette there; did somebody erase it since the toy doesn't have one? Conveniently, the cosmic swirls behind the figure seem to flow right through his fingertips. When the comic Hellblazer started, writer Jamie Delano wanted to call it "Hellraisers," but that name was kind of taken. Thanks to all the New 52 reboots, Hellblazer is the longest-running comic at DC (and beating all the Marvel books, too), but it's recently been announced that it will be ending with #300. Constantine is a rare comicbook character who has aged in real time (having been born on May 10, 1953), but with the end of his Vertigo book, he'll just be folded into the DCU proper and be subject to the same comicbook time as every other superhero. He doesn't even have his scar any more! 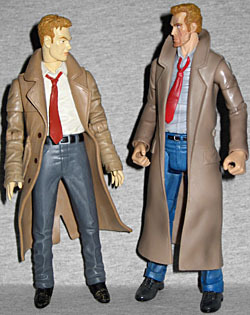 Unless Mattel is planning on starting a whole Vertigo/Justice League Dark subset of toys, John Constantine isn't really a great choice for an action figure. So what the hell(blazer) is wrong with me that, between DC Direct and Mattel, I now have two of him? !